Constructing a pond can definitely be confusing at times. These kits come with all the necessary components to build a complete pond with professional results. Take the guesswork out of purchasing essential components separately with these integrated kits. Get your feet wet with these smaller entry-level priced kits. 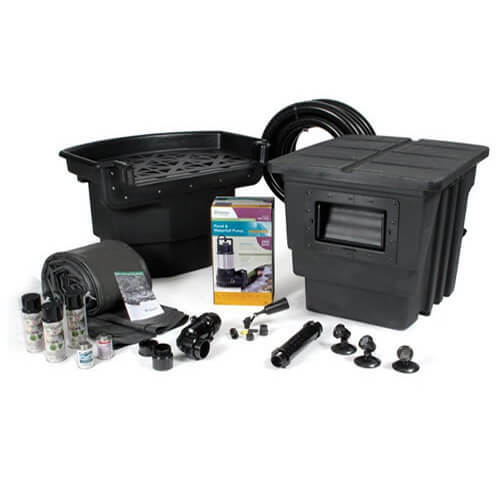 These kits offer everything needed to build a small pond up to 1,000 gallons. These medium sized kits fit into tight spaces yet are big enough to make a substantial design impact in any landscape setting. Don't let larger ponds intimidate you. These pre-packaged kits will ensure you have all the right components for the job. The Aquascape DIY Backyard Pond Kit comes complete with everything you need to build a beautiful ecosystem pond in any space. All necessary components are provided in a convenient, all-in-one kit that takes the guesswork out of purchasing individual components. The included skimmer and BioFalls filter provide efficient mechanical and biological filtration, allowing you to spend more time enjoying your pond. The AquaSurge 2000 Pond Pump provides ideal flow for recirculating water in the pond. The Aquascape Large Pond Kit comes complete with everything you need to build a beautiful 21′ x 26′ ecosystem pond in any space. All necessary components are provided in a convenient, all-in-one kit that takes the guesswork out of purchasing individual components. The included skimmer and BioFalls filter provide efficient mechanical and biological filtration, allowing you to spend more time enjoying your pond. A complete LED lighting package is included to help bring the waterfall to life at night. The kit also includes the Automatic Dosing System for Ponds with water treatment, automatically adding water treatments to the pond when needed. The Aquascape Small Pond Kit comes complete with everything you need to build a beautiful 8′ x 11′ ecosystem pond in any space. All necessary components are provided in a convenient, all-in-one kit that takes the guesswork out of purchasing individual components. The included skimmer and BioFalls filter provide efficient mechanical and biological filtration, allowing you to spend more time enjoying your pond. The AquaSurge 3000 Pond Pump provides flow rates up to 3,196 gallons per hour, providing the ideal flow for recirculating water in the pond. The kit also includes the Automatic Dosing System for Ponds with water treatment, automatically adding water treatments to the pond when needed. These are the true Savio kits, with all equipment supplied by Savio Engineering! Savio Pond Packages™ include everything you need to build a full size pond with professional results. Best-selling Savio filtration components and designs assure low maintenance and a healthy ecosystem. You can't beat the simplicity of installation. The Aquascape Medium Pond Kit comes complete with everything you need to build a beautiful 11′ x 16′ ecosystem pond in any space. All necessary components are provided in a convenient, all-in-one kit that takes the guesswork out of purchasing individual components. The included skimmer and BioFalls filter provide efficient mechanical and biological filtration, allowing you to spend more time enjoying your pond. A complete LED lighting package is included to help bring the waterfall to life at night. The kit also includes the Automatic Dosing System for Ponds with water treatment, automatically adding water treatments to the pond when needed.